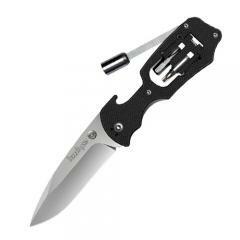 The Select Fire Plain Edge folding knife from Kershaw isn't just a knife, it's also a versatile pocket multi-tool. In addition to the large steel blade, the Fire includes a swing-out bit driver and a four-piece bit set with two flathead and crosshead options. The bits are stored in an on-board, swing-out carrier built right into the handle for total convenience when needed most. The rugged, satin-finished blade features a drop point design with a sharp point for controlled piercing and a generous plain edge for slicing. Convenient thumb studs effortlessly deploy the blade while locking liners secure it while in use. The Fire hangs from a single-position pocket clip for convenient portability.